This piece is also huge! Compare the size of this Toy Fair mock up to the scale of the Ewoks Logray carded figure in the image. 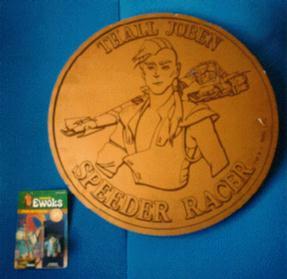 This mock up is several feet in diameter and was used as part of a larger Toy Fair display. This is one of a kind piece matches is bronze-colored unlike the gold finish on the production Droids coins.